This specimen was not considered as a specimen suitable for casting. It is, however, an extremely unusual and rare specimen. It is a trace fossil in a fossil palm tree section. 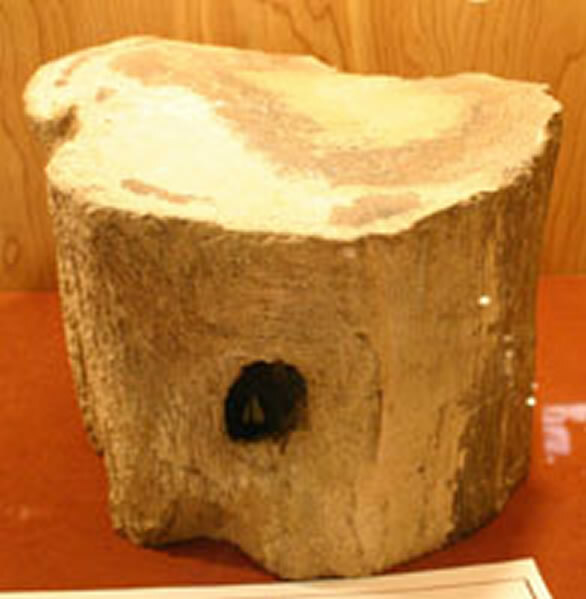 I have never seen another piece of petrified wood with a bird's nest in it and I have never heard of a bird's nest in a palm tree trunk. Unfortunately the verbage on the card is not clear enough to read. The specimen is in a private collection. It was found in the Golden, Jefferson County area of Colorado. The size of the specimen is about 15 - 18 inches in diameter and the same in height. The hole is about 2-1/2 inches wide and probably goes back about 5 inches. To see some other rare specimens, please view other pages in this web site. Also enjoy the other products and information on this web site. New additions, and updates, are made to the site monthly. 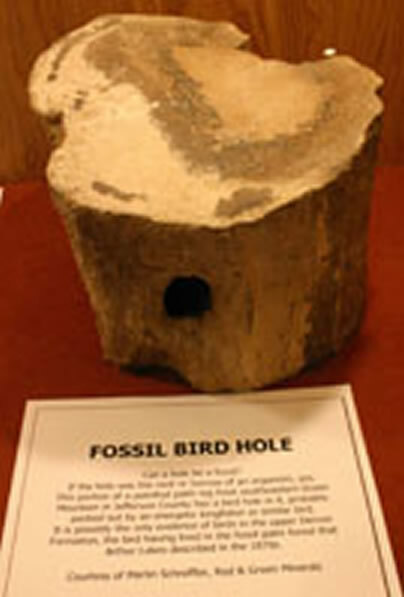 Fossil bird nest hole in palm tree section. Fossil bird nest hole in palm tree section - close up.